Patrick White's brilliant 1961 novel, set in an Australian suburb, intertwines four deeply different lives. An Aborigine artist, a Holocaust survivor, a beatific washerwoman, and a childlike heiress are each blessed—and stricken—with visionary experiences that may or may not allow them to transcend the machinations of their fellow men. 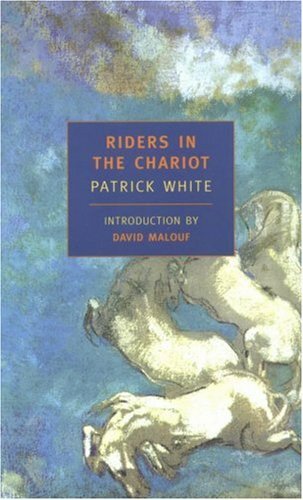 Tender and lacerating, pure and profane, subtle and sweeping, Riders in the Chariot is one of the Nobel Prize winner's boldest books. Their quest is never complete, for the novels maintain a nervous, unsettled energy, failing in their open endings to reach the completeness of understanding for which they strive so hard. White's writing style is cohesive with this central theme of the movement toward being. Although the stylistic elements have been criticized, especially the tortured syntax, they must be accepted and appreciated as inseparable from which is being said. For White's language struggles, too, and sometimes fails, along with the characters and their actions. Finally, the novels are not all solemnity but record as well the comic side of the irrational and illogical world in which men and women are placed to seek some sort of meaning. A fifth-generation Australian from a wealthy landowning family, White was educated in England, served in World War II, and then settled in Sydney, where he wrote his major novels. Always fascinated by the theater, he also wrote several plays, but they never met with the success his fiction has and have not been produced outside Australia. White's initial reputation was made in the United States and Europe, where his work first received publication. Few Australian critics recognized the greatness of these novels, which would alter the face of Australian literature. Although most of White's work is set in Australia, he handled the traditional materials in new ways, turning away from the realistic tradition of Australian fiction and moving into metaphysical realms. Once White received the Nobel Prize, the first writer of the British Commonwealth to be so honored, the resistance in Australia toward his work largely faded. Yet he remains an international figure. His work has been translated into many languages, and the abundant criticism that continues to appear comes from all parts of the world. David Malouf was born in 1934 in Brisbane, Australia. He attended Brisbane Grammar School and graduated from the University of Queensland. Malouf's first published work was "Interiors" in 1962. Since then, he has published eight poetry collections, eight novels, an autobiography and a play. He has also written the libretto for Richard Meale's opera, "Voss." He has been awarded the Prix Femina Etranger, the Commonwealth Writers' Prize and the Pascall Prize. David Malouf uses life in Australia as a major theme in his work, with much of his fiction recreating his childhood in Brisbane.